Focusing on international news, and as a means of broadcasting China’s voices, China Mosaic is in full swing airing commentaries on the world’s big events in both Chinese and English. Wang Xiaohui, the host and Editor-in-Chief of China.org.cn joins in discussion with pundits who weigh in with their views on the issues being covered to give a unique perspective. Wang Xiaohui is editor-in-chief of the China Internet Information Center and vice president of the China Academy of Translation. Wang has successively served as a translator with the Foreign Affairs Bureau of Xinhua News Agency, vice director of the Liaison Department of the Foreign Affairs Bureau of Xinhua News Agency, manager of the London office of Xinhua News Agency, director of the Overseas Department of the Information Center at Xinhua News Agency, and CEO of China.com. Since 2009, he has served as vice president and editor-in-chief of the China Internet Information Center. 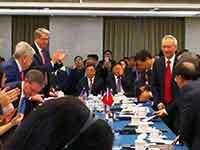 A new round of China-U.S. vice-ministerial trade talks has concluded. This was an important step to implement the consensus reached by the leaders of the two countries in Argentina last month. With the passing of Stan Lee last year, it was reported that one of his unfulfilled wishes was to see the well-known Marvel character and kung fu master Shang-Chi, created in the 1970s, appear on the big screen. 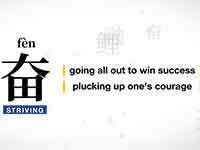 "Striving" has been chosen as the Chinese Character of the Year 2018 reflecting the domestic situation. The scroll entitled "Wood and Rock" by Su Shi was sold for HK$463.6 million (US$59.2 million) at Christie's Hong Kong Autumn Sale 2018 on November 26.